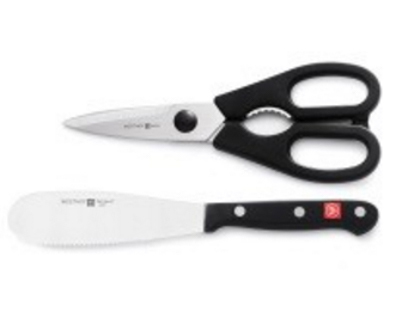 Set includes 5-inch spreader and pull-apart kitchen shears. The spreader's wide serrated blade slices easily through meats & cheeses, and is handy for spreading condiments. Sturdy, corrosion-resistant kitchen shears are perfect for cutting stems from herbs, trimming meats or shaping parchment. They come apart for easy cleaning.